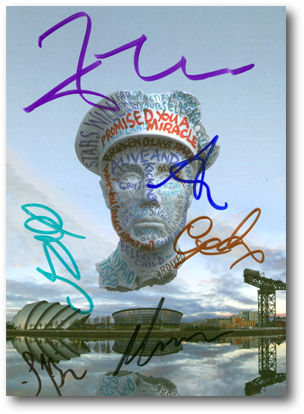 " In the end it had to be Glasgow! I am of course talking about where we have decided to shoot the Simple Minds in concert film that is due to be released next year. Our first filmed concert release incidentally, since our quite famous Verona concert, which was itself released in 1990. Yes, that long, a whole lifetime away in someways. " " But why Glasgow, and even more so, why now in particular ?" " Well, among those with the experience to judge, many would probably agree with the notion that Simple Minds shows are currently hitting a new kind of peak. Put it down to the present band line - up, the vast selection of songs, the quality of sound and lights, and never forgetting of course, the involvement of our energetic audiences that play such a part wherever we perform. It is the amazing consistency of all of this that has pushed us into deciding that this would be the right moment to capture these hot and sweaty, but still magical nights, that we are in the midst of experiencing. " " And why Glasgow? No, it is not only sentimental reasoning that has made us commit to choosing our "Dear Hometown". Although that obviously figures somewhere. And why not? We are a Scottish band after all, and Glasgow not only gave birth to Simple Minds, but has nourished and encouraged us throughout our careers. Scotland itself, has and will always be intrinsic to who we are, and how we sound. It is our "alma mater", let's never forget! Like the place itself, we are made out of the same "rock and rain", therefore what could be a more relevant situation? " " But why in that case, you might ask, having read my bluster. Have we never filmed a Glasgow show prior to this? Well, Barrowlands apart, where we did after all film the Waterfront clip, we feel that Glasgow has in the past suffered in terms of having the most desirable venues. In other words, we never felt that we had a venue that we could show off to the world, one that matches the impressiveness of a Scottish audience. Until now that is. " " Because finally change has - a - come, in the form of the newly built and recently opened SSE Hydro arena. And by all accounts we are now all set to film in a venue that can provide the kind of environment that Simple Minds live in Glasgow probably deserve, and we now have building that merits showing off. " " So please wish us luck on Wednesday 27th of November. Given that it is also the birthday of Charlie Burchill, such a date will always play a part in the history of Simple Minds. Nevertheless, in Glasgow next Wednesday, Simple Minds will be trying to add a little more history to our as yet never ending story. " - Jim, 24th November 2013. After a long wait, Simple Minds announced the filming and release of a second live concert. (The first was Verona, issued back in 1990). The venue chosen was the newly constructed SSE Hydro in Glasgow. " To say that we were impressed with what we saw would be a massive understatement. In fact, we were initially quite speechless, such was the impact. We agreed that what we saw has the makings of what may well be the perfect arena venue. Of course, Simple Minds fans can have the opportunity to decide for themselves the true merits of this venue when we perform there. As for those who cannot be there, well you will still have the chance to experience the atmosphere of that night due to our decision to film the show. " - Jim. Simple Minds were the first band to film there. Danny O'Connor of Document Media was chosen to oversee the 25-30 personel capturing the concert, and hired Matt Askem as editor and director. It was originally decided to release the DVD through then-current label Virgin Records. This in turn reflected the set-list which was primarily Virgin material. After the band left the label, they decided to release the deluxe edition themselves whilst finding another label to release the standard edition. The deluxe edition was the first format announced with pre-orders taking place in November 2013. The four disc set included: a DVD of the concert, a DVD of exclusive interview footage and photo gallery, two fully mixed audio CDs of the concert, a bound book featuring specially written notes, exclusive live photos from the tour, a photographic print autographed by the band and a 3D lithographic cover. This featured the "night" version of the artwork. Those who ordered the deluxe edition before the end of the year also received Big Music Live EP which was really just a sampler of the DVD. The menus and introductions featured a new version of Theme For Great Cities. It kept close to the original studio version but featured new chords and textures by Charlie. The entire concert was featued on DVD #1. Most of the inter-song banter was retained. Jim joked about the size of the new venue being comparable with Charlie's house at the end of I Travel. Which in turn prompted a chrous of Happy Birthday to Charlie from the audience. And the whole band were formally introduced after Glittering Prize. However, for understandable reasons, Jim's speech before Big Music where he asked for a good audience reaction was edited out. Big Music was going to be the first single from the forthcoming Big Music LP and this footage was going to be the accompanying video. DVD #2 included the bonus material. Life In A Day featured both stop-motion photography and live footage of the setting-up of the concert, the preparations beforehand, the arrival of fans and the gig itself. All the photographs were taken by Alan Wild. It was backed by the album versions of Life In A Day, Theme For Great Cities and See The Lights. Band Interviews was split into three separate sections and included an interview with Jim, an interview with Charlie, and interviews with the rest of the band: Mel, Andy, Ged and Sarah. Big Pictures was a slide-show photo gallery of performance shots taken by Alan Wild. Some of these were also included in the booklet. It was backed by hacked-up, over-compressed repeating loops of parts of Belfast Child. Black And White was another slide-show photo gallery of black-and-white stills by Alan Wild, although this collection was mostly individual portrait shots. It was backed by an repeating intro-loop of See The Lights. The audio CDs featured the entire concert but all Jim's banter (and " Happy Birthday " sung to Charlie) were edited out. The glossy 50 page booklet included pouches for the two DVDs and two CDs at either end. It was packed full of pictures by Alan Wild of the group live on stage. Each band member wrote a shot piece about the concert.
" Growing up in Glasgow I was always mesmerised by the few guitar shops in the city. Close by was the �Green�s Theatre�, a very famous venue on the touring circuit as Glasgow audiences were well known for their enthusiastic response at gigs. The first show my brother Jamie took me to see there was Led Zeppelin, and in the moment the band hit the first note I realised that this was what I needed to do in my life, play guitar in a band on stage. I made it my mission to not only look at the guitars in the stores but to buy one and move toward realising the dream. " " We knew that this night at the Hydro was going to special with the show being filmed for the first Simple Minds live DVD release since Verona in 89. No pressure then... "
" In the days before the Hydro show, there was a great sense of anticipation from everyone that a shiny new concert venue was about to be christened... "
The pattern on the DVD and CD labels was based on the blueprints of the Hydro ceiling. The audio was mixed by the band's long serving live audio enginer Olivier "GG" Gerard. His team also mixed 5X5 Live. The deluxe edition was the only version to include the entire concert. 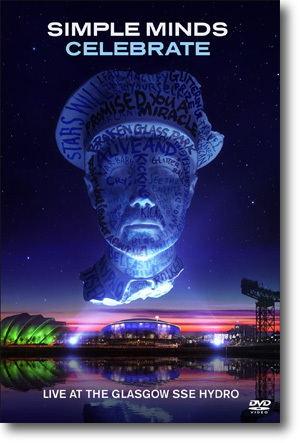 Commerical editions including the DVD Celebrate- Live At The SSE Hydro Glasgow, Blu-Ray Celebrate- Live At The SSE Hydro Glasgow released by Edsel and limited edition double LP Celebrate - Live At The SSE Hydro Glasgow released by Demon dropped some of the songs. The audio was released as a digital audio release through iTunes on the 2nd October 2014.